All in fun, for charity. Six Minnesota leather families (clubs, groups, organizations or just groups of five individuals) competed in the first Leather Families Feuding for Charity tournament on Saturday afternoon, November 22, at the EagleBOLT Bar in Minneapolis. The event was a triple fundraiser. Each family’s registration fee went into a pool that benefited two charities chosen by the first- and second-place winning families. In addition, audience members’ $5 cover charge benefited Minnesota Leather Pride, providing funding for future events like the upcoming Minnesota Leather Sir/boy and Ms. Minnesota Leather Pride contests. The six teams, of five players each, were: Atons of Minneapolis; Knights of Leather, playing for Avenues for Homeless Youth; MAsTers (Masters And slaves Together); The Ladies of the Lakes, an order of the Sisters of Perpetual Indulgence; Impawsters (a team of puppies and handlers); and FORE!, playing for the National Coalition for Sexual Freedom. The tournament was the brainchild of host/emcee David Coral aka Jazz Thomas, who since childhood has loved television game shows and often fantasized about being a game-show host. When he mentioned his idea for a “Leather Families Feuding” fundraiser to the board of Minnesota Leather Pride, they decided to sponsor the event—and he had a chance to make his fantasy come true. As host/emcee David Coral (center) reads a question, Andrew Bertke (left) of the Atons of Minneapolis faces off at the buzzer with Randy Ingram-Lile (right) of Impawsters. Photo courtesy of Andrew Bertke. In addition to Coral, other community members involved in putting together the fundraiser included Vicki Knight and Tim Hotchkin. Ryan Brown provided technical and public-relations assistance and Bobbie Smith provided set construction. The tournament was based on teams choosing the most popular responses to questions asked of large numbers of people. That meant questions had to be written (by Coral/Thomas and Hotchkin); surveys then were conducted at leather- and GLBT- community events throughout 2014, including every GLBT Pride event in Minnesota, to find the most popular responses to those questions. Sample questions included “Name something hard” (a popular answer was “Math”); “Name something you would find in a dungeon”; and “Name something you would do before going on a long trip.” Answers to these questions and many others were tallied to determine the most popular answers given, and the distribution of questions throughout the tournament was statistically balanced to ensure the highest possible degree of fairness and impartiality. Finally, computer screens or “boards” were prepared that would reveal the most popular responses to the questions if players guessed them during tournament play. Each tournament round started with one member of each family racing to be the first to “buzz in” on the question once it had been announced. If the player who was fastest with the buzzer was able to name the most popular response to the question, their family then was able to offer what they hoped would be other popular responses, earning points for each popular response they were able to name. However, if a family gave too many responses that were not among the most popular on the survey, the question passed to the opposing family. That family then had the opportunity to steal the first family’s accumulated points, and earn more points as well, by offering responses that were popular on the survey. A round ended after each family member had been given a turn at the buzzer. At that point, the family with the largest number of points won the round. The Impawsters, the first-place leather family in the Leather Families Feuding for Charity tournament. Photo by Andrew Bertke. Tournament play started with three rounds of two families each. The winners of those three rounds, along with a fourth family chosen by a “wild card,” advanced to the two semifinal rounds, and the winners of the semifinals advanced to the final round. At the end of the final round the winning family was Impawsters, who earned a $700 donation for Rainbow Health Initiative. The Atons of Minneapolis’ second-place finish earned $200 for The Aliveness Project. In addition, over $250 in audience admission charges went to Minnesota Leather Pride. 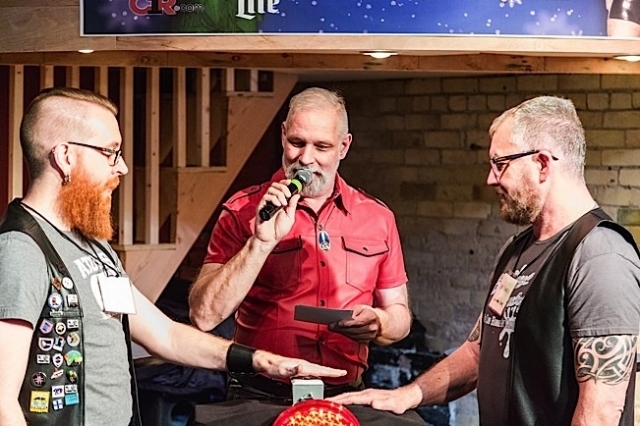 If you missed Leather Families Feuding for Charity, take heart—Minnesota Leather Pride was so pleased with the event that they promise it will happen again. Stay tuned.